Buy pears online. Omega Farms sell Bartlett organic pears online. Buy pears online and have a Bartlett pear gift basket delivered to your door. Buy pears online. Omega Farms sell Bartlett organic pears online. Buy pears online and have a Bartlett pear gift basket delivered to your door. Buy pears online from Omega Farm's organic pear orchards. Delicious Bartlett pears make an ideal gift and now you can buy pears online. Skip navigation. 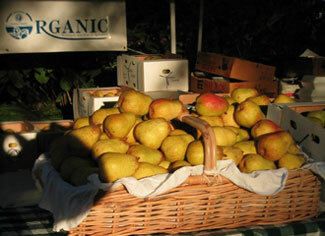 Buy pears online from Omega Farm's organic pear orchards. Delicious Bartlett pears make an ideal gift and now you can buy pears online. Buy pears online. Omega Farms sell Bartlett organic pears online. Buy pears online and have a Bartlett pear gift basket delivered to your door. Omega Farm is a WSDA Certified Organic pear orchard located in Ridgefield, Washington.We take great pride in producing only the highest quality bartlett pears. We fondly call them pearfection® and would love to share them with you! Call (360) 573-0422 to purchase our new gift boxes! We are open in season for on the farm sales by the box or by the pound, just a short drive from Portland, OR. Click here for directions. Summer is flying by here in the orchard. As I look around I see many other trees just like me loaded with fine looking pears. We are having an occasional visitor here in the orchard. It was a little concerned at first but so far Mr. Deer has only been doing a little nibbling on my lower branches and I can still grow my leaves right back. So far Pear guy has done a good job of applying my organic sprays to keep the bad guys at bay but I have to stay after him. I've got a great looking crop. But already I am looking foreward to the middle of August when my branches are unloaded and those great pears are tucked safely into cold storage waiting for you. Well, that is about all I have to report for now. We will be busy soaking up the water and sunshine in anticipation of harvesting a fine crop of pearfect pears for you. See you in September.